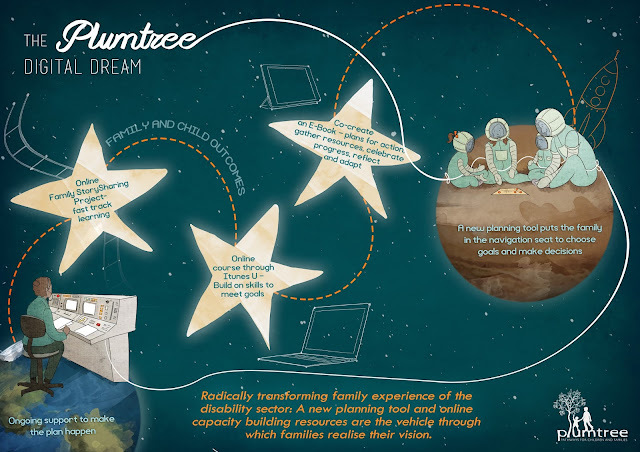 In collaboration with Plumtree (plumtree.org.au) EGL started research in 2014 to radically change the experience of families with the disability sector. The visual representation below describes the path that this exploration follows from an innovative and fun way of planning to learning and sharing online stories and parents recording progress in an electronic book with multimedia capability. Gaps in planning and implementation processes for these families have been identified. It is clear that old planning methods are not suited - and that new paradigms need to be explored. We have piloted our method with families and integrated their feedback as we rolled out our programme to a larger cohort of 70 families. This work is part of a comprehensive research programme aimed at building evidence for new planning and implementation methods.